More proof today of the illegal regime's prediliction for ignoring corrupt and fraudulent behaviour when it suits it. 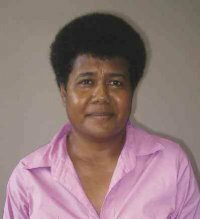 Frank Bainimarama is quoted by FijiLive as saying the investigation at Fijian Holdings Ltd is over and that's where it ends. Bainimarama is quoted as saying: “It’s done and let’s leave it at that,” refusing to say any more. 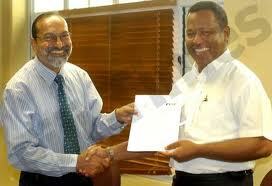 The FHL chair, Isoa Kaloumaira, and managing director Sereana Qoro 'resigned' last week after being busted for fraud. 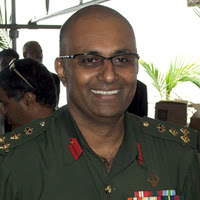 Bainimarama's handling of the FHL fraud is typical modus operandi - bury all questionable and illegal behaviour and relocate perpetrators to save face: Qoro and Kaloumaira have been allowed to 'resign' and Aziz has been brought in to where they can keep an eye on him until an 'appropriate' spot can be found for him. Pictures: The culprits that Bainimarama says they've dealt with but who look as though they got away scot free: Mohammed Aziz (top), Aiyza Muza (second), Sereana Qoro (third) and Isoa Kaloumaira (right in bottom picture). What else do you expect from a pea brain moron. Baini ay ...only when it suits you say "let's just leave it at that". Do the shareholders realise how badly their company has been managed by these parasites? C4.5 can you tell us who actually owns shares in FHL and also who is the majority shareholders. Aziz knows all about the corruption on AG and PM and hence holds the Ace in his hands.
" If you expose me - i will open my mouth"
Well what else would you expect of an illegal regime that has committed numerous criminal acts and would want protect its own. It is one way of buying the loyalty of their cronies. They are certainly being treated differently from Rokovunisei/Nemani, Vuetaki/Naiorosui and others who did very similar things. I pity the shareholders of FHL who will have to bear the losses from this episode. Well Isoa and Sereana, how does it feel to be called a common culprit? Whatever reputation you may have had has been flushed down the toilet for being in cahoots with the Evil One. You can relax and be happy, you are now just a common culprit and thief, just like the rest of them. Too late. Sa oti. So FICEKE was drudging up FHL records on Qarase that was decades old and trying to find charges to lay on him from years ago and for this lot of thieves Baini say's "we'll just leave it at that" after calling them "culprits"?? Where is the promised transparency and no corruption you?? Well obviously nowhere to be found as the only reason the coup was carried out was to escape charges and get rich!! Typical irresponsible and idiotic response from Bai. And this is why Economically speaking his regime will fail and fail and fail again. I hope the Provincial Council reps go and tell the villagers what has happend to their money. Where is the investigation report?? why are these people still 'culprits' when obviously nothing fraudulent was found - if there was indeed 'fraud', why is there no report and no charges?? it's just politics spoiling these people's reps.
@Anonymous 9:45pm You must have been living under a rock. What about the millions they lost while trying to acquire Mobil? Even the bean-peanut-boy at the bus-stand would have told you it wasn't going to work. Both the Az's [ Illegal AG and disgraced Brig ] know far, far too much about the illegal dealings of the Vore, that the Vore is being forced to 'look after" them. This time, the Vore[vuaka] is forced to gel with the muslims and for their survival the mozzies likewise!!!! Wanna read about some real (scary) Viti business compentency? Current Board of Fiji Sugar Corp oversaw the complete breakdown of a lucrative "growth" export industry. When the extent of the damage both social & economic was eventually realised - instead of resigning - Board actually promoted the one person best qualified to advise (warn)them about such "tecnical" matters (but didn't) - person who oversaw disasterous Mill Refit program. By such strange logic did former Board member "engineer" Adul Khan become new guiding light of FSC. Farce continues - although it can't fulfil existing contract with Tate & Lyle - FSC currently negotiating with Australia & Japan - for "forward" products it more than like won't have? Positive thinking - or sheer unadulterated insanity?